The Barker Character, Comic & Cartoon Museum in Cheshire, Connecticut is a unique institution, consisting of some of the most complete expressions of an American childhood throughout the ages. The Museum houses the personal collection of Gloria and Herbert Barker, which consists of almost 80,000 items that took over 40 years to create. The collection, which spans the years from 1873 to the present, starts discussions among the generations in a way that few museums can. 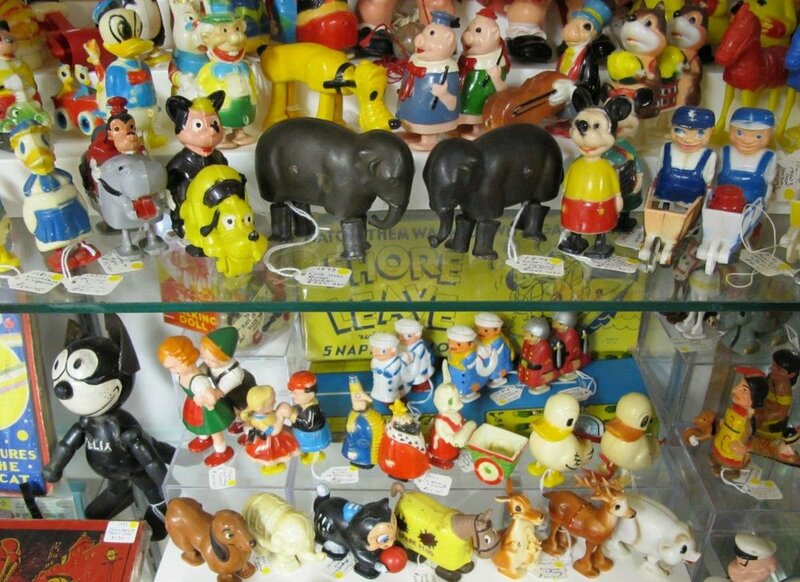 Every generation will find favorite toys on display, and historians can enjoy an unusual glimpse into styles and trends of the past, as well as the present. Throughout the museum there are countless lunchboxes, ranging from “The Chan Clan” to the sci-fi television show “V”. Lunchboxes are lined across the ceiling, making it a real sight to see. The oldest toys in the Museum are the cast iron elephant ramp walkers shown below. Manufactured in 1873 by The Ives Toy Company of Bridgeport, CT, they were the first automatons to be powered by gravity. 140 years later, they work just as well as the day they were manufactured. The museum can be visited Wednesday through Saturday, 11am-4pm. Admission is $5 for adults and $3 for children under the age of 17. Admission is free for active duty military personnel and their immediate families. The museum can be found at 1188 Highland Ave, Cheshire, CT.